From michezoafrika.com After a morning tussle between the KPL, Ticket Masters and Gor Mahia over ticketing for this weekend’s match pitting Gor Mahia and AFC Leopards, Ticket masters will handle the ticketing for the match after all. Gor Mahia had intended to change their ticketing agents to Wells Fargo after suspicion of short handedness within Ticket Masters’ handling of tickets. 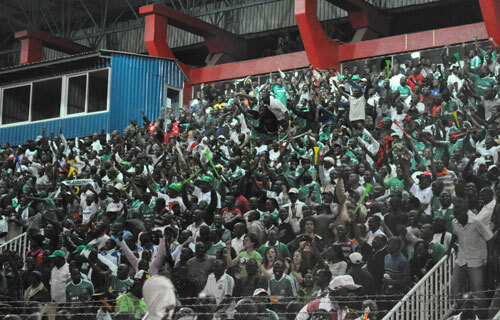 There were complaints by a huge section of Gor Mahia fans that the figures released after matches by Ticket masters involving Gor Mahia were way below and not corresponding to the number of fans in the Stadium. “There had been problems within the ticketing between us and Ticket masters. We had decided for a change that we use Wells Fargo and see the difference. However, when we presented the request to the KPL committee they said that it was too late to implement and therefore denied the request. Therefore, Ticket Masters will handle this match”, he said after the meeting on Friday morning at the Nyayo National Stadium. Tickets will start selling on Saturday morning and no tickets will be sold at the match venue; Nyayo National Stadium. Tickets will be sold at the Hope Centre, City Stadium, 20th Century, Kenya Cinema, Mumbai Plaza Gikomba, AFC Leopards Kawangware branch office and Buruburu. VIP Tickets will be going at 500 shillings while terrace tickets will sell at 200 shillings. Gates to the Stadium open at 11am and close immediately the match starts. 24,000 tickets have been printed for the match; 2,500 for VIP and 22,500 for terraces. YOUR HONOR MR CHAIRMAN PLZ PLZ WE NEED A GOOD LEADERSHIP IN OUR BELOVED TEAM.1,GOR NOW BE HAVING THEIR OWN PLAYING GROUND, 2,PLAYERS INSURANCE,3,YOU SHOULD KNOW HOW 2 STOP HOOLIGANISM, 4,THIS THING OF WALKING AROUND WITH TEAM DAT MEETING PEOPLE TOUR YOU SHOULD STOP IT COZ PLAYERS ARE THE ONE GETTING FATIGUE.AN WE SHOULD ALSO IDENTIFY PLAYERS AS EARLY AS POSSIBLE.